After a cold April when trees refused to leaf and daffodils continued to flower, May flew in bringing warm, sunny weather putting a smile on all our faces. 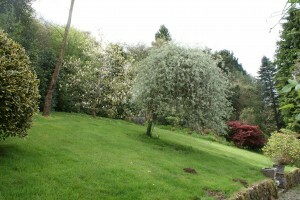 At last the trees are turning green and the garden looks Spring like as Azaleas,apple blossom and Magnolia candles grace our garden. The gardens at Darrynane Spring 2013! 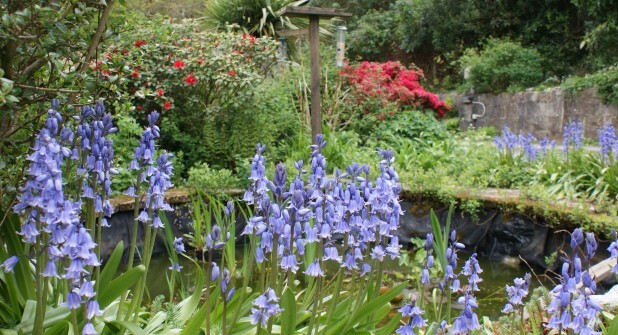 Bluebells circle the pond outside our kitchen window, shown at the top of the page. It gives me a lovely scene to watch while washing up and there’s always plenty of that to do. 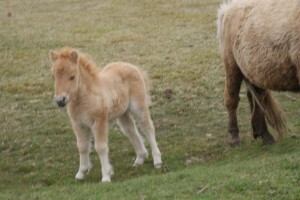 Bodmin moor is full of new life. 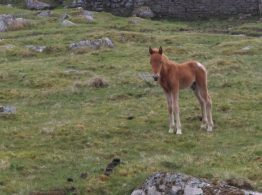 Young foals stay close to their mothers as older foals, growing confident, stroll off together exploring every new nook and cranny. 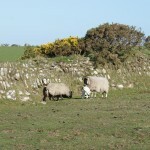 Lambs trot after their mother’s too enjoying nibbling at the moorland grasses. The months of hard work at The Lodge have been worth it as guests arrive delighted with the results. Its first guests have booked for September and a month in Spring 2014 and its second guests wishes to return this Autumn -wonderful. I’ve just had to take Marsbar, our 13.5 year old German Shorthaired Pointer, to the vets. A lump appeared last week to complement his many others, unfortunately this one is painful and on his leg. They can’t do anything for him, just keep him comfortable. He now has some delicious medicine, which he cobbled down. We are keeping our fingers crossed that this does the trick. The average age for the breed is much younger than Mars. He still enjoys his walks so as long as he is happy and able to fulfill a good life but if this leg does not improve I fear we may have to make a decision soon. 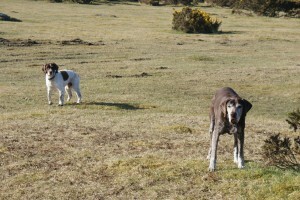 Mars and Pebbles enjoying a walk on Bodmin moor in May 2013! It’s all change here as the children grow and move on. Tim is starting the next stage of his life as he leaves home next weekend for a new job in Bristol. Ameisha begins her exams today and finishes school officially on Thursday – she’s off to Truro college in September. Sebastian, at Uni in Wales, also starts his exams this week and then starts his Archeology dig until mid June. We have a few weeks available in July if you are considering a break or a longer holiday – please contact myself or David for details.